The prints on display were all hand printed by Tim on fibre based Ilford Warmtone paper using split grade and split toning techniques and without exception were beautiful to behold. Anyone who has spent time in a darkroom making monochrome prints would instantly appreciate the expertise and dedication to perfection of tonal range and density that has gone into making these images. It was a truly beautiful display of photographic art and artisanship and many of the exhibited prints are accurately reproduced in Iceland An Uneasy Calm. The closed hardcover book measures 31cm x 29cm, the material, reproduction and print is of good quality. The scanning was undertaken by Tim Parkin and the comprehensive foreword to the book is provided by respected USA based photographic artist, Bill Schwab. 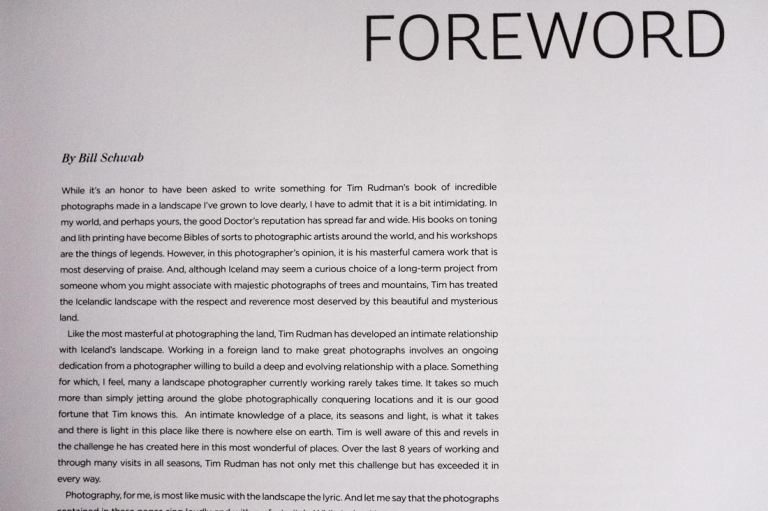 In a new world order of photographic instant gratification and unintelligent or superficial comment by so many vloggers, bloggers, forum divas and camera owners who-shout-the-loudest, books such as this restore balance between forgettable mass appeal and enduring photography as art. Where some YouTube channels and forums will leave you with a feeling of being tainted after involving yourself with them, Iceland An Uneasy Calm will inspire, uplift and generate aspirations. It is not possible to create and print images of such sumptuous quality or breathtaking beauty as Rudman’s by using plugins or dubious digital manipulations. That as a path may well bring close and even a good replication, but one must become an artist by serving their time as a photographer to create images and prints of this quality and that takes a lifelong investment in dedication to refining skills and creativity. Part of the exhibition (currently touring the UK) explains Rudman’s darkroom technique. His complex printing-in and selective contrast control and toning methods are described and set out in examples of his work prints. Previsualisation of the end goal and the skills to analyse the possible route options for teasing optimum detail, texture and contrast from the negative and enlarging paper’s properties are essential. Such abilities are not acquired and refined overnight. Iceland has for many years been at the top of most landscape photographer’s bucket lists. There is nowhere quite like it, it is a popular destination with good reason. Where half a million images of Skógafoss will annually be uploaded to photography forums and social media and largely forgotten about by viewer and author alike shortly afterwards, Rudman’s hand-crafted prints possess qualities that command a closer look with an indellible impression. 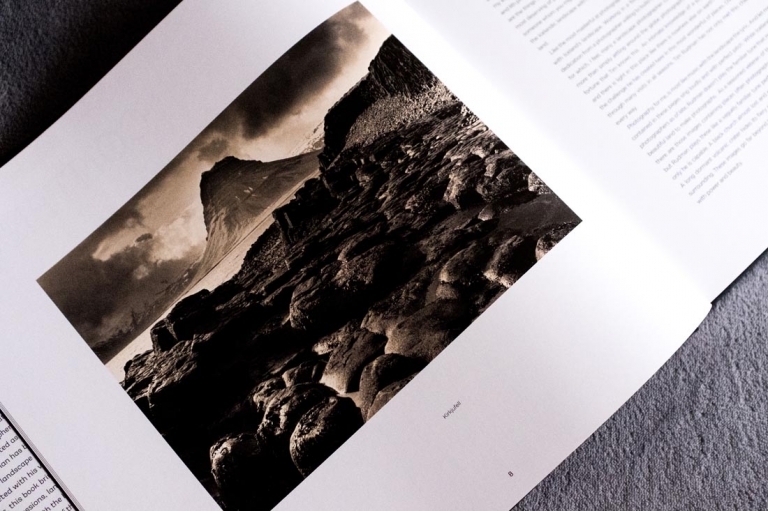 You know a monochrome print is a great print when the tones and contrast illuminate the room and almost all in this book are capable of doing that. This piece would not be much of a comment without the inclusion of a mild criticism. I have one and it refers to the puzzling omission of images or text that leaves ten left hand pages blank, as in the image above. These are deliberate blank pages and no doubt there is a reasonable explanation for that, but to my eye and against my background in reprographics, the gaps seem rather odd. I’ll live with the blanks though, this book is a tour de force and should be on every landscape photographer’s bookshelf. 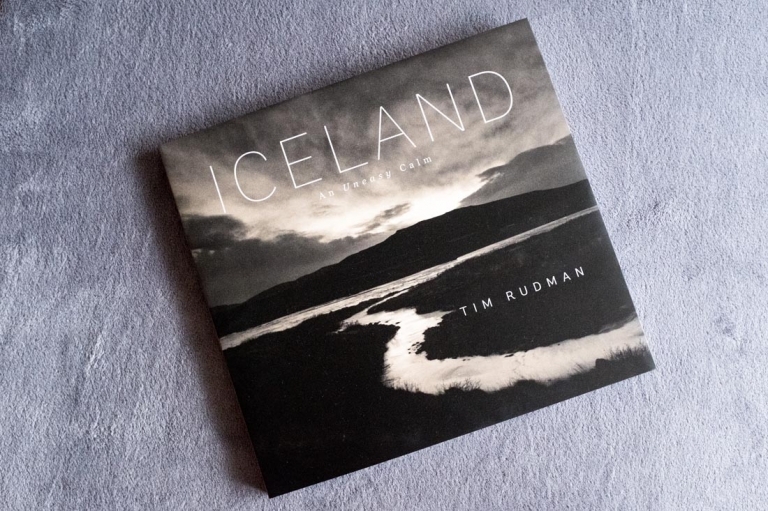 Each plate is a delight for both the quality of Tim Rudman’s photography as well as his masterful control of the printing. Buy Iceland An Uneasy Calm and be inspired!